The Ploughman team who beat Netherton. They are George Robertson, Liam Robertson, Carl Joseph Baker, Martin Sharp, Leon Gellizeau, Reece Kenton, Jamie Harrison, Gary Gibbs, Martin Curtis, Jake Slater, Danny Hilliam, John Regan, Michael Weston, Tom Lancaster, Callum Fensome and Jake Fensome. Ploughman won the Peterborough Sunday Morning League’s Charity Shield curtian raiser last weekend. 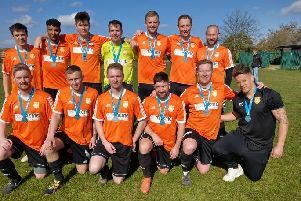 The Werrington-based side, winners of last season’s Hereward Elite Cup competition, beat reigning top-flight champions Netherton United 3-2 in a competitive clash at PSL. Leon Gellizeau, Gary Gibbs and Tom Lancaster scored for Ploughman with Paul Jarman and Loreano Da Silva replying for Netherton. The League season starts this Sunday (September 6) and Ploughman have a tough start at Parkway, winners of the PFA Senior Cup last season and the team who finished second to Netherton in the Premier Division. Netherton, who have been Premier Division champions for the pastfour seasons, are at Bretton Park to tackle newly-promoted Bretton North End. Division One - which is the top division this season - boasts just six teams who will play each other three times. The other top flight fixture this Sunday is at Lawson Avenue between AFC Stanground and Baston. Baston played as Thurlby United last season. Stanground have returned to the competition after a year’s absence. There are 34 teams involved in four divisions. Division Two side Artemis pulled out this week. The League is keen to attract qualified referees for this season. Anyone 18 and over who wants to officiate on a regular or occasional basis should contact Alan Swann at alan.swann@jpress.co.uk. Referees are paid a flat fee of £25 per match.